Dong Fangxiao at the Sydney, Australia, Games. The International Olympic Committee on Wednesday stripped China of a bronze medal in the women's team event at the 2000 Olympic Games after finding one of the team's athletes was underage. The United States will be awarded the bronze medal instead, the IOC said in a news release. The International Gymnastics Federation (FIG) in February decided to cancel all results obtained by gymnast Dong Fangxiao at the Sydney, Australia, Games. "The FIG conducted an inquiry which showed that the athlete was only 14 years old during the 2000 Sydney Olympic Games," the IOC said. Under FIG qualification rules, athletes must be 16 in the year of the Games in order to compete. The IOC's executive board on Wednesday decided to reallocate the results of the events that Dong participated in. She had placed sixth in the women's individual floor exercises and seventh in the women's individual vault. Dong has been disqualified from all the events she participated in, which also included the women's individual uneven bars, the women's individual all-around and the women's individual balance beam. That is the correct thing to do. But what about the medals of the underage gymnists in the 2008 olympics, there were plenty of underage chineese gymnists winning medals at that olympics. Its a shame that this could not be stopped before they compete. I am sure who ever rightfully earned the medal would liked to have received it at the actual ooympics. We all know that every time we have the games that the Chinese put underaged kids in the competition. Shame on the olympic committee for taking so long to find this out. Next time they should check more closely at the time the games are going on. Strip the medals of the 2008 games because we all know those girls were underaged. As a mother of a young American gynnast, it was dissapointing to watch the Olympics in 2008 knowing that with "baby teeth missing", that those Olympics are possibly tainted as well. China is probably capable of falsifying documents since the government controls everything. Did they cheat? – MAYBE. I, as an American, have no explanation to my daughter about why the IOC fails to see what was clearly underage gymnast. An xray of a gymnasts hand, I believe doctors have reported, would have been a great diagnostic check. Also, how did the "gold medalist" fly under the radar and not participate in any international events prior the Olympics? Maybe they were clearly "too young" at that time too. The IOC clearly needs to investigate the 2008 Games AGAIN – this time more objectively. The IOC has an obligation to present a fair, honest Olympic format as an example to our younger generations. Anarchy,Definition; A state of LAWLESSNESS and DISORDER. So it took 10 years to take the illegally obtained metal back and give it to the actual winner. Now, someone figures she should be given something because she won it and was the third best in the world? Y'all just mad because the US didn't win initially. The bottom line is that little girl was better. 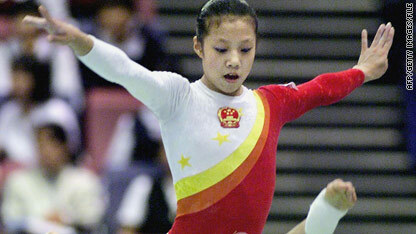 really...the girl was 14 that's 2 years under the age to compete which is called cheating their is a reason they have rules and the chinese think they are above the rules and that it don't apply to them.I have no doubt that half of their 2008 team were under age as well.The Chinese have a history of cheating and if I was the IOC I would ban them from competing in the next Olympics or even 2 to teach them and other countries that cheating will not be tolerated anymore.